The Olympics openings ceremony is one of those rare times when the world comes together to celebrate the best athletes in the world, a moment of pomp and circumstance to embrace the fact that despite all of our differences, we're all on this planet together. But c'mon, it's also an opportunity for each country to show off its uniforms, and for the rest of the world to judge them. And while most sartorial criticism is usually reserved for other countries' duds, some Americans are a bit bewildered by the details of Team USA's 2018 Winter Olympics apparel, which was officially unveiled on Monday and will be showcased during the Parade of Nations in PyeongChang on February 9. Specifically, people aren't quite sure what to make of the giant fringed gloves. Team USA's latest getups might best be described as evoking a sort of cowboy-meets-wealthy ski bum look, complete with enough red, white, and blue mixed in to make it very clear what country they're repping. Overall, they're decidedly snazzy, but it's the oversized brown suede gloves with fringed edges that have some people scratching their heads. As it has for every Olympic Games since Beijing in 2008, Ralph Lauren designed the uniforms for PyeongChang. Besides the brown suede explorer gloves with fringe and hand-beading, this year's full head-to-toe look also includes suede mountaineering boots with red laces, slim cut jeans with "moto-inspired" seaming, a leather belt, navy wool hat, a navy USA-themed bandanna, a patriotic knit sweater, and a red, white, and blue down parka equipped with a built-in electronic heating system to ensure athletes don't get too cold. The designer brand's chief innovation officer describes the outfits as "celebrat[ing[ the American spirit," but there's no telling exactly what the designers drew inspiration from. That certainly hasn't stopped people from speculating on social media, though. Still, as perplexing as the suede fringe may be for some, many are singing the uniforms' praises. Some have gone so far as to claim they're the best Team USA has had in years. 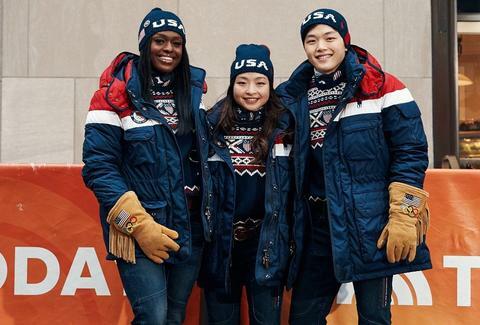 Only Team USA delegates will get to wear the special apparel at the Olympics, but you can practically assemble a uniform for yourself piecemeal from the Ralph Lauren website, where most every item is for sale right now. Unfortunately, you'll have to hold out a bit longer to pick up a pair of the gloves, as they're still listed as "coming soon." Joe McGauley is a senior writer for Thrillist. Follow him @jwmcgauley.